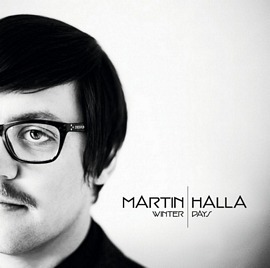 The Voice-winner Martin Halla’s debut album Winter Days is released in Norway today. The album, which has been produced by Magne Furuholmen and Martin Terefe, is available now on Spotify, Wimp, iTunes and on CD. In addition to providing backing vocals and playing various instruments on the album (including piano, synth, guitar and wurlitzer), Magne has also co-written five of the songs. The album was recorded at Martin Terefe’s Kensaltown Studios in London and Magne’s Passionfruit Recording Studios in Oslo, while the string arrangements were added in Nashville. “The album was supposed to be released in November last year, but we chose not to rush things. We found out that we needed a few more songs”, Halla tells newspaper Romerikes Blad.